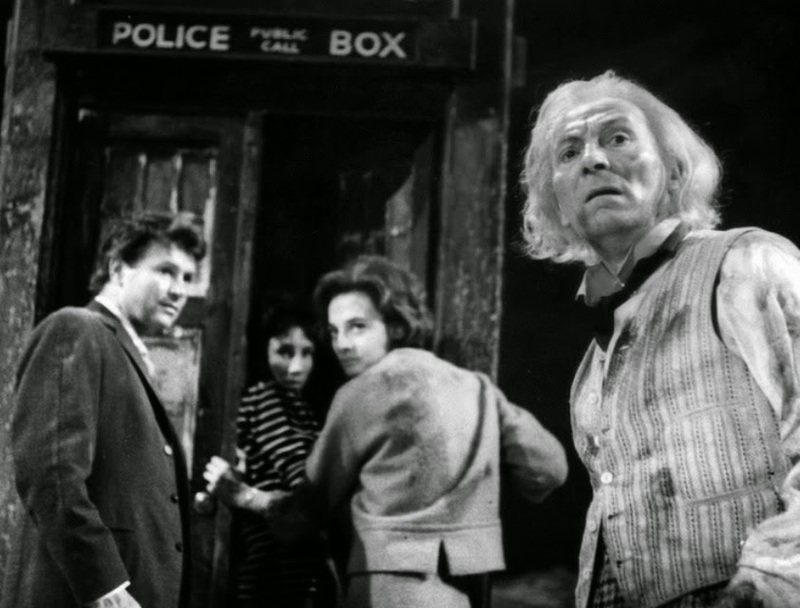 Wonderings in the Fourth Dimension: 1: An Unearthly Child - The Roots Of An Iconic Series. 1: An Unearthly Child - The Roots Of An Iconic Series. Monsters/Villains: A tribe of stone age cave people. Brief Synopsis: The very first episode, in which school teachers Ian and Barbara, follow a suspiciously odd and intelligent pupil of theirs, Susan, to a junkyard, where they meet her Grandfather, the Doctor, and are unwillingly taken back in time to the Stone Age in his time/space machine. When I was younger and very in to the Pertwee-McCoy years of Doctor Who in colour, I hardly even attempted to watch the few remaining black and white stories of William Hartnell and Patrick Troughton; who I'm now realising are hugely overlooked. So initially, I was expecting to have to endure these first 6 years of black and white. However, only 1:10 in and I find myself already appreciating the advantages of this presentation. I love what you can't see, and what's implied. I enjoy trying to work out what all of the junk in totters lane actually is, and that my ideas may be totally different to those of the next observer. Similarly later in the episode the choice to not see the beast that mauls Za, the leader of his tribe, is clearly one of budget. However it is almost scarier as your imagination takes over, filling in the blanks more horrifically then the imagination or the budget of the DW production team could stretch. 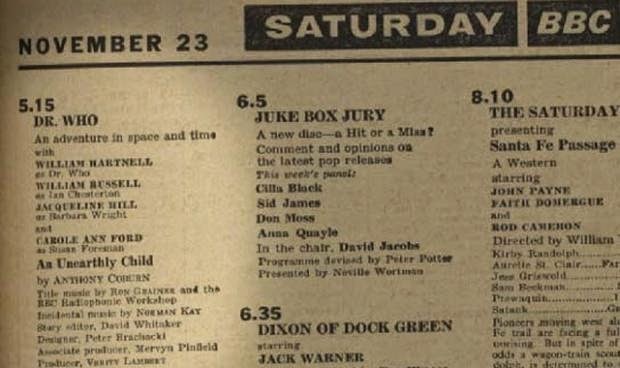 The first ever DW cliffhanger from An Unearthly Child. It seems a somewhat odd opening adventure for a science fiction piece, but also a strangely logical place to start a time travel epic, with what as an audience and species is our roots of history: the stone age. 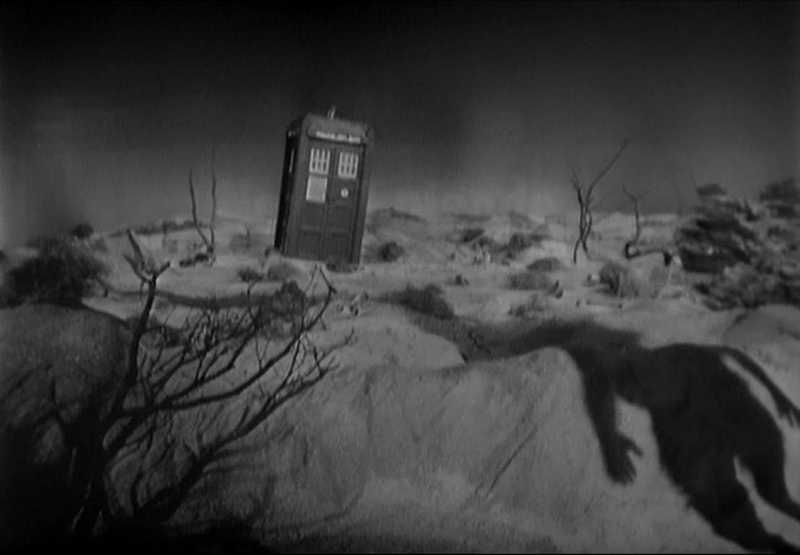 The first cliffhanger in DW history is brilliant. It's simply the TARDIS travelling in time and space and appearing in an, as yet unknown location. What from now on we will take for granted is truly given the kudos it deserves. I love the use of silence here, simply employing the visuals to portray the story-telling, as we are slowly shown around the TARDIS seeing it's inhabitants knocked unconscious by flight, and then the exterior as the shadow of an unknown stranger falls upon the foreground. Considering that these early episodes were created to be shown only once, they live up to the test of time incredibly well. The sixties was a time of inventions and newly enhanced expectations of the future and when Ian demands the TARDIS' size must be an illusion the Doctor reiterates a fable of a Red Indian fearing the first steam train as a mere illusion. He also uses what for this time would have been a fairly recent invention of the Television to explain the Tardis. That by showing an enormous building on a television screen means having achieved what seemed impossible. This must have really resonated with a 60s audience. As I watch I realise just how much this first outing truly shows the roots of the iconic series Doctor Who will become. Ian feels the TARDIS and pulls his hand away declaiming "it's alive." Which we will later discover it is. How both the Doctor and Susan think it's odd the Tardis hasn't changed shape to disguise itself as they arrive on a new planet. Which is hardly mentioned again for sometime but later gives us the explanation of the Chameleon Circuit, which will see only a few attempts to be fixed. Susan says of the Doctor "He's always like this if he doesn't get his own way." This is very much the way one would speak of a child or a younger person, and even though the Doctor appears here as an old man he will later be revealed to be relatively young for a "Time Lord" at this point. With hindsight it feels almost as if we are only meeting this Doctor towards the end of his story. This also perhaps explains his seemingly juvenile behaviour when he clearly tries to use a rock to 'put Za out of his misery.' As Barbara is surprised as the Doctor tries to keep her motivated, as the team attempt to cut their bonds in The Cave of Skulls, and the Doctor says "fear makes companions of us all" referring to Barbara and Ian for the first time in the way their successors will be recurrently described; as 'companions.' Perhaps giving us the very first clue as to why the Doctor hardly ever travels alone. Then Barbara replies "I never once thought you were afraid," endowing the Doctor from the very start with a bravery which will only grow and develop as the years roll on. Then as a further response from the Doctor, "Fear is with all of us and always will be. Just like that other sensation that lives with it ... Hope" and in just three lines of dialogue, the Doctor's and also the series's futre co-ordinates have been set. Ian and Barbara are clearly the characters we are meant to associate with, and retrospectively it seems odd that they enter the TARDIS and set off on their travels totally unwillingly. This seems strange after watching so many to follow marvel at the TARDIS and it's capabilities, begging the Doctor to take them with him. The danger in this episode is so immediate, and real. The Doctor and his companions aren't exploring yet they're just trying to survive. 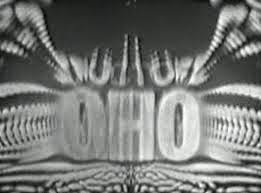 At the end of this story another iconic devise is introduced, after all the difficulty the TARDIS crew have gone through to escape the Tribe of Gum they finally reach their destination only to discover that the Doctor doesn't actually know how to fly the TARDIS or get Ian and Barbara back to their correct time and place. A flaw that will get the Doctor into all sort of adventures in time to come. 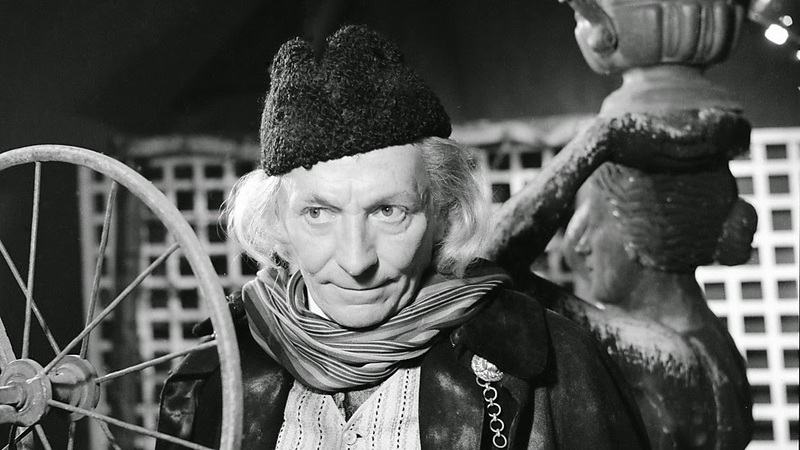 I fully enjoyed An Unearthly Child and I find it utterly amazing how something made in 1963 can fascinate me so much. As this is the very first episode of Doctor Who it can't really go wrong. As it has so clearly crafted an outline for the rest of the series to follow. Or has it? Join me next time for The Daleks.